Oh, would you look at that: apparently war has broken out. Yes, while I was away, an honest-to-God shooting war broke out between the United States and — some kind of a third world country, I’m guessing from the pictures coming in? “War! It’s war!” Are we winning? We’re not winning, are we. 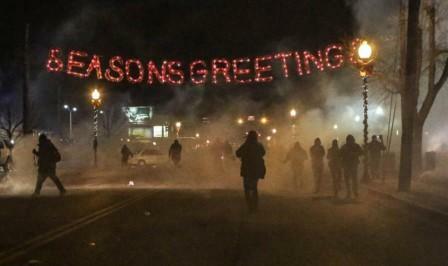 More on the Ferguson War to follow. I’ll put the archives back up later. [They’re up.] And coming up tomorrow: a Haitian history extravaganza! Good that you escaped; I was just about to pay the ransom. Looking forward to you resuming the regularly scheduled programme. Well how about it! Unamusement Park returns! Hooray! So glad you’re back. Unamusement Park makes it fun to be a racist. I am so ecstatically happy that you are back, that I almost did a happy dance. This is the best Christmas present! Please don’t go away again, because this blog is so awesome that I’ve read every article and category in it at least three times!! So, she finally dropped you, eh? Well, good to have you back. Glad to see you back. My go-to list of race realist and ethno-nationalist sites is sadly depleted. Quite a few old favorites simply vanished; others have migrated and moderated until their comment sections are indistinguishable from respectable right sites. I want moar history and facts and analysis and snarky, racist comments! Unamused, you should steal this slogan! Season’s greetings to you too… ah… motherfucka. Obama had committed many OUTRAGES in your absence! Welcome back. You should do a full post on “Africa Addio.” My friends and I agree that it was our favorite documentary, period. Oh, I was just about delete UP from my RSS feed and then bumm! Welcome back on board, Capt’n! Unamusement Park—Makes being racist fun! (^_^) as HBDChick would say (the femininity of it feels a little weird to me). Also, yes, yes it does.